Had another sunny Sunday ride today. 7 degrees and a bitterly cold wind – I was togged up like Eskimo Nell. 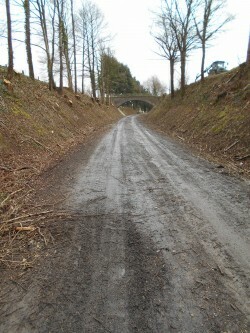 The voie verte up at Barenton le Teilleul station has been trimmed and they’ve really gone to town on it – about 90 per cent of the trees are gone, so what was formerly a shady, beautiful ride, currently looks horribly denuded and like a building site. I’m not quite sure what the reason is, but after 20 years I have more faith in the process – trees are merely a crop and will grow again, and even now, the views across country that have opened up are really beautiful. All it wants now is some green on the banks, and some rain to wash away the tractor marks in the frozen, rutted mud, which made today’s ride a bone-shaking experience. Steve had his first go with the GoPro on the bike, photographing our old boy Zola, who was 15 in October, and has a heart condition. You can see the full video here. As you can see, Zola loves his doggyhut. He doesn’t spend all his time in it – we did about 12km today and he ran for at least three of it. Whereas when we walk round the park, he bumbles around, conserving energy, but when he has the hut to hand, he really runs hard, knowing that he can get in and ride like a prince all the way home.